A small colonial town with an immaculate zócalo, a monastery, a cenote, a great market and amazing history. And the famous Yucatec egg meal, huevos motuleños. City Hall at the zócalo. A small town with a rich history. So far I have been here only once, in 2018, but would happily return. So let’s start from the beginning. Like all large cities and small villages across the Yucatán peninsula, Motul was formerly an ancient Maya site. Around the 6th century priest Zamná led the migration of the Itzá people in the Yucatán Peninsula to the west, founding cities such as Ek Balam, Izamal, Motul and T'Hó (current Mérida). In the 11th century a priest named Zac Mutul played some role here and gave the city its name. Mutul in Maya means the bird mut (thrush or pheasant) but it can also mean a knot. I can't speculate which of the two applies. Ceh Pech province (in grey) in the 16th century. Source: wikipedia.org. 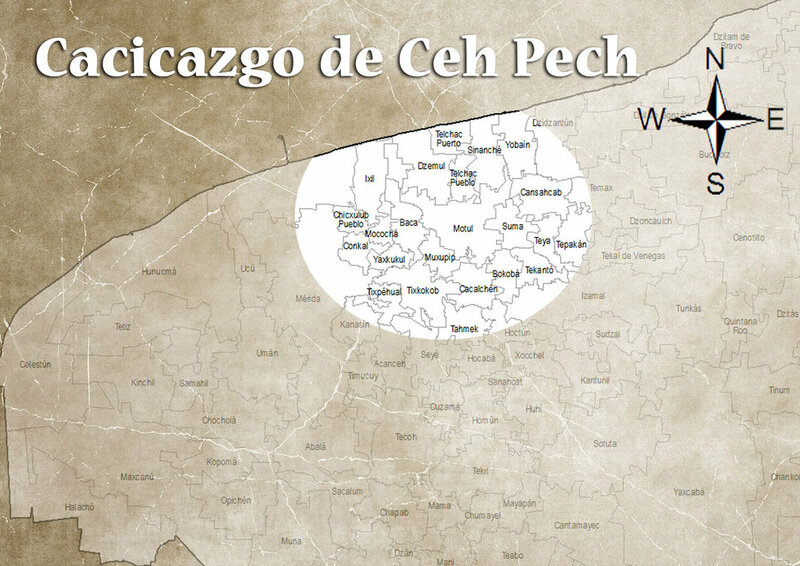 The chiefdom of the Ceh Pech dynasty. Source: lavozdemotul.com. Later generations are tied with the dynasty Ceh Pech. Naum Pech is considered to be the founder of this dynasty that ruled here from the 15th century and gave the region (or kuchkabal) its name. He was a relative of the Cocomes dynasty of Mayapán and reigned in Motul from 1470. Other members of the Pech family lineage ruled in nearby locations, for example Tunal Ah Pech settled in Maxtunil, Ah Kom Pech was seated in Xulcumcheel. Mutul was the seat of power for the whole region. So when you come and visit here and you think it is a small provincial town, think of its royal and political power in the past. Zócalo, the main square, by the Town Hall. Dining with Rhod at the zócalo during our visit in 2018. And then came the Spanish conquistadors. Francisco de Montejo converted the Maya city of Mutul into the Spanish colonial city of Motul in the 16th century. Naum Pech welcomed the Spaniards and was baptised Don Francisco de Montejo Pech and later wrote a chronicle of the Conquest. During the colonial times, the Franciscans established here the church and monastery San Juan Bautista (1567-1580). We have witnessed the church ceremony here, attended by many locals. I did enquire whether it was a special celebration but was told that all services were so popular here. 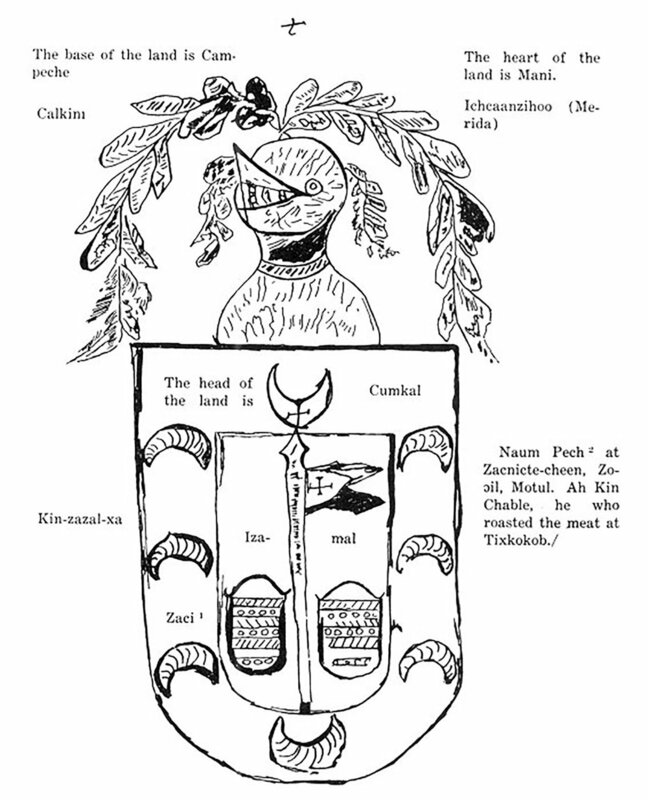 The armorial bearings of Yucatán, including Naum Pech reference. Source: sacred-texts.com. Motul was long considered the heart of the henequén zone. The Maya land was given to the Spanish military captains for their services (subduing the Maya) who set up half a dozen haciendas in its vicinity as henequén plantations and desfibradoras (factories for extracting fibre from the agave leaves). They used the Maya as slaves. I describe the conditions of the Maya peóns in many posts (see my section Haciendas). 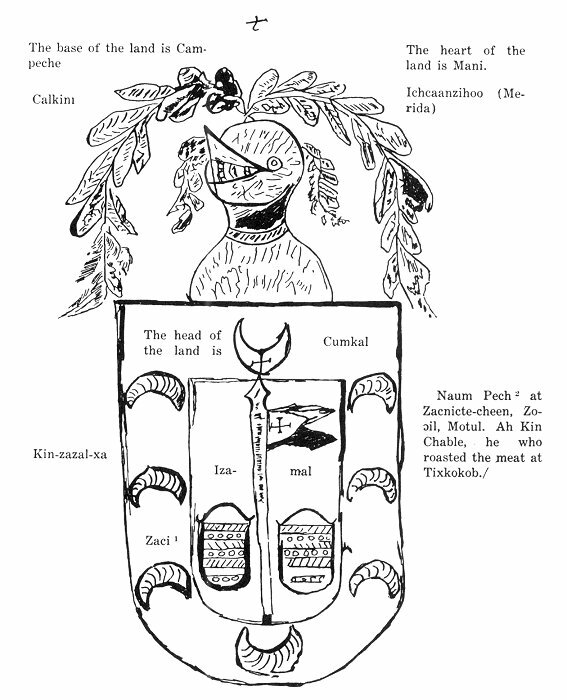 If you look closer at Motul's coat of arms (the image on the left: wikipedia.org), you can see a machete and a coa (a large hooked knife), used by the field labourers, a hacienda arch, a henequén plant and the name of the Maya founder, Zac Mutul. There are a few haciendas still standing here. 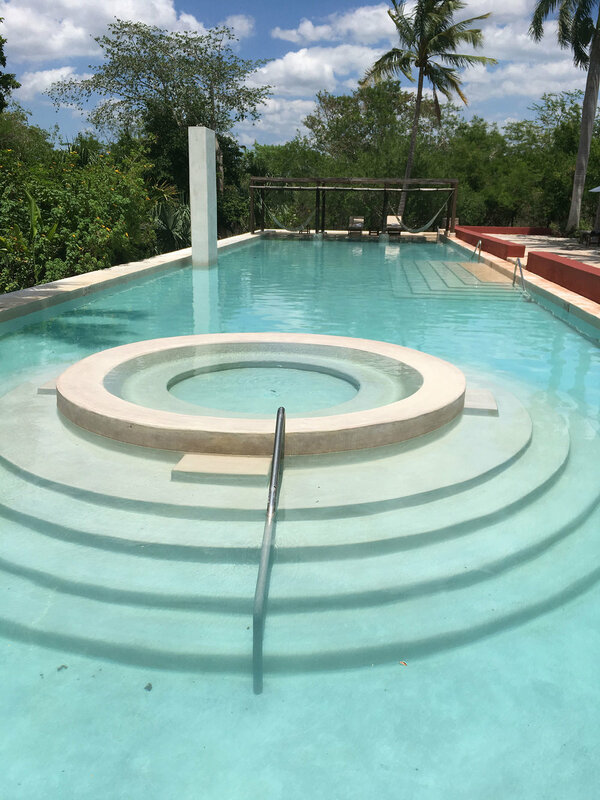 Hacienda San Antonio Dzina (just south of the cenote Sambulá) is for private events only, but you can take a tour or have lunch at Hacienda San José Cholul, south of Hacienda Dzina. To the north of Motul you can find Hacienda Paraíso Komchen. The cenote Sambulá (for a dip, or diving if you get to the large cavern through the secret channel) right in town also has remnants of a former hacienda. If you want to go there and you don't have a car, I recommend taking a 'mototaxi' (motorcycle taxi), a cheap and fun way to get around the town. There are plenty about. 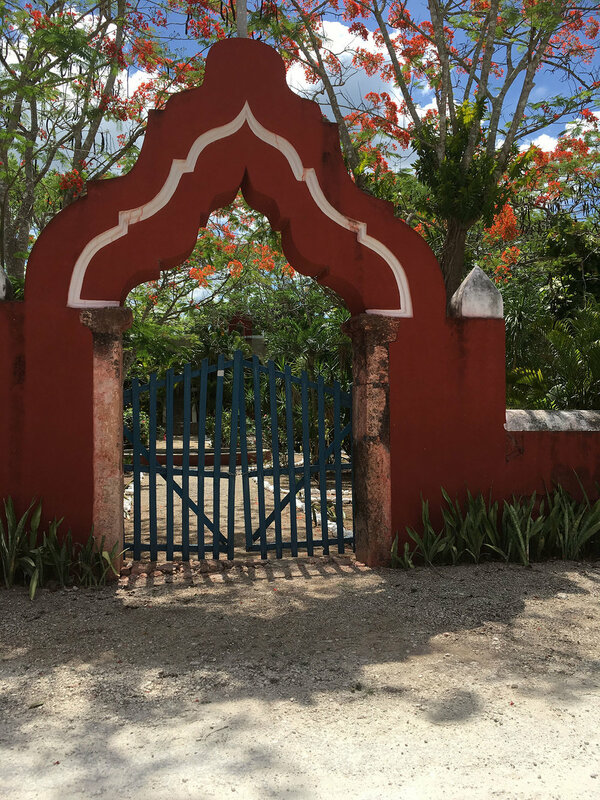 The entry gate to the Hacienda San Antonio Dzina, south of the cenote. 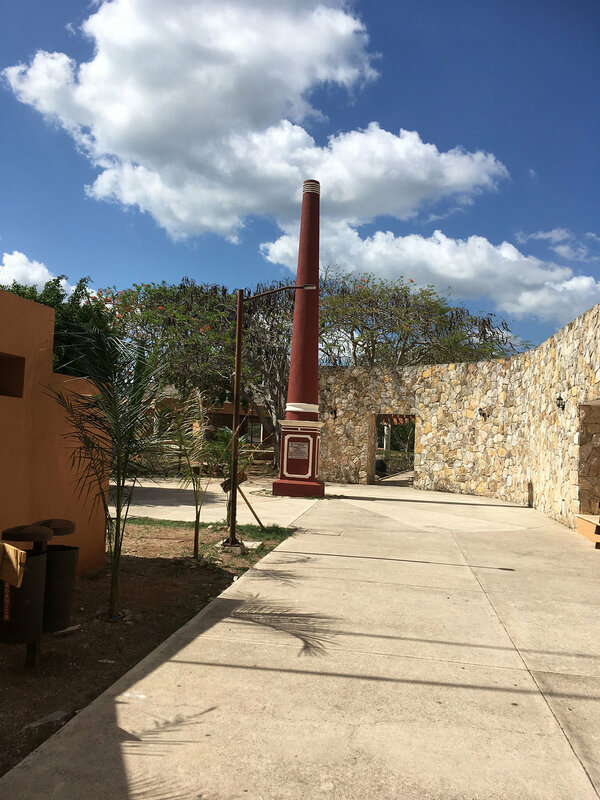 The hacienda chimney at the cenote Sambulá, a former hacienda land. The iconic pool of Hacienda San José Cholul. At hacienda San José Cholul. Motul is the hometown of Felipe Carrillo Puerto (he was born here in 1874). A child of a middle-class cabinet maker, he became a politician for the rights of the indigenous Maya. His father claimed Maya ancestors, perhaps even the legendary opponent of the Spanish conquistadors, Nachi Cocom. Felipe Carrillo Puerto. Source: wikipedia.org. As an adult, he became troubled by the conditions he saw on the henequén haciendas. As a journalist he was jailed, fled into exile twice and in 1913 he joined the revolutionary Emiliano Zapata. 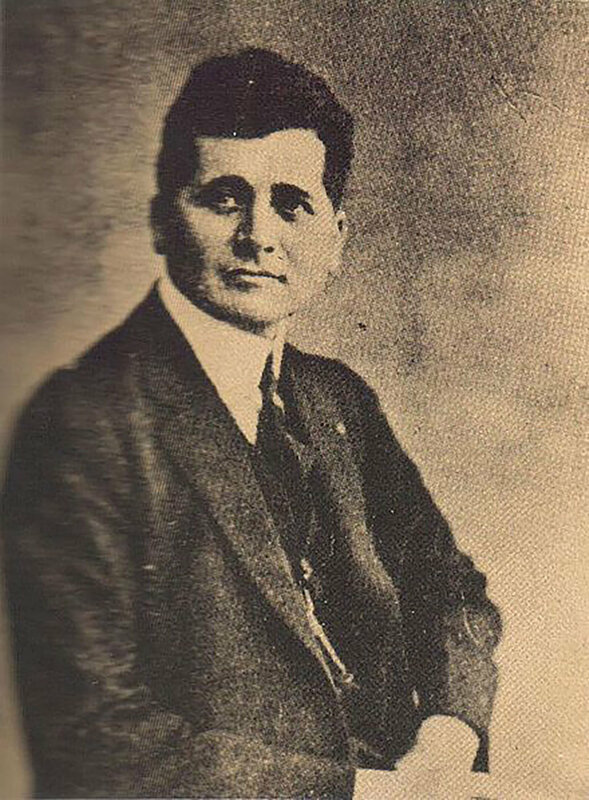 He became Governor of the state of Yucatán from 1922 to 1924. In his brief twenty months in the office, he was able to make remarkable advances in education, land reform, labour law, and road-building. He opened Maya archaeological sites to the world and founded an Academy of the Mayan Language. However, boiling political conflicts brought Carrillo Puerto down. He was executed alongside his three brothers. He is known locally as the Red Apostle of the Mayas. 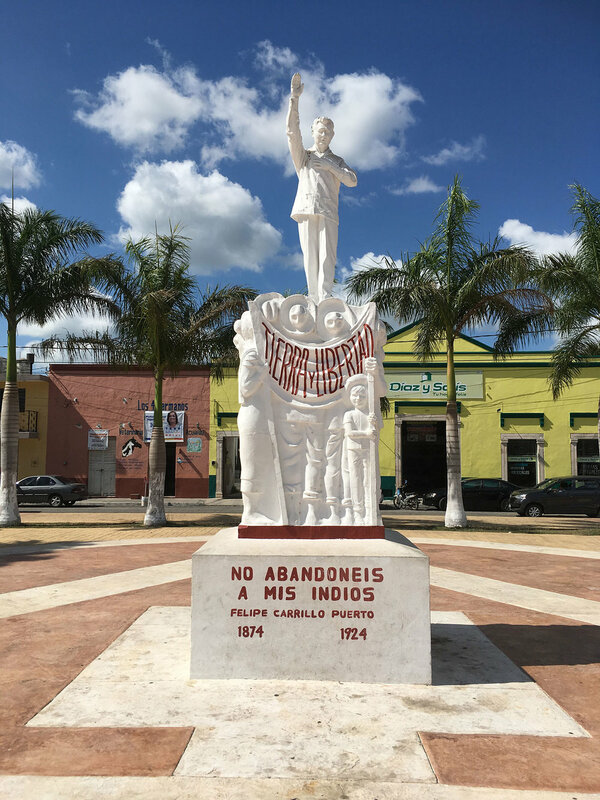 Between the market and the church is the main park dedicated to this socialist governor, with his statue and carved words of his famous statement: 'Do not abandon my Indians'. He is actually standing on the shoulders of the Maya whom he loved so much. A statue of Felipe Carrillo Puerto at the park flanked by the church. The park is popular with the locals; it is their social space. 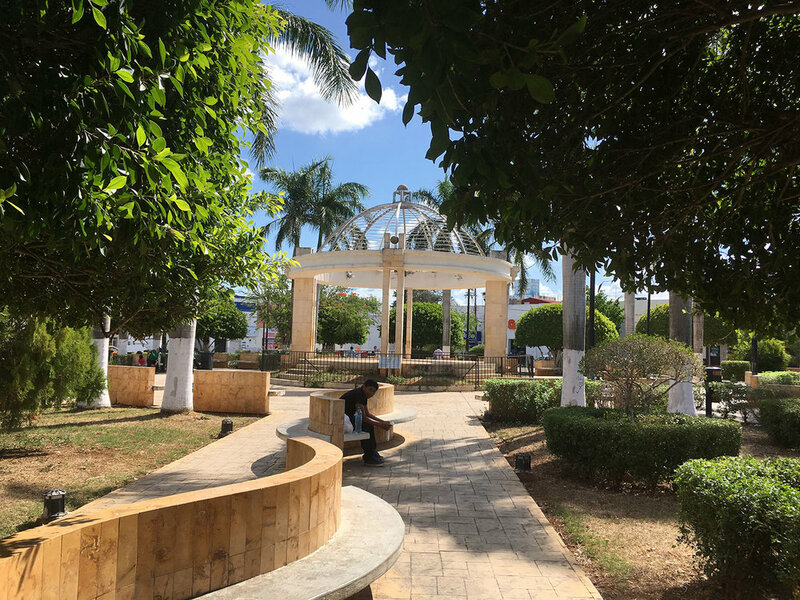 The park is truly pretty, with well trimmed trees, plenty of benches that the locals love to sit on and socialise, and, of course, the local vendors with tacos (fried tortillas with meat or vegetables), tortas (a bun sandwich with avocados and beans), toys and trinkets, you name it. The market itself is great value. This is how you get to know the authentic Mexico. 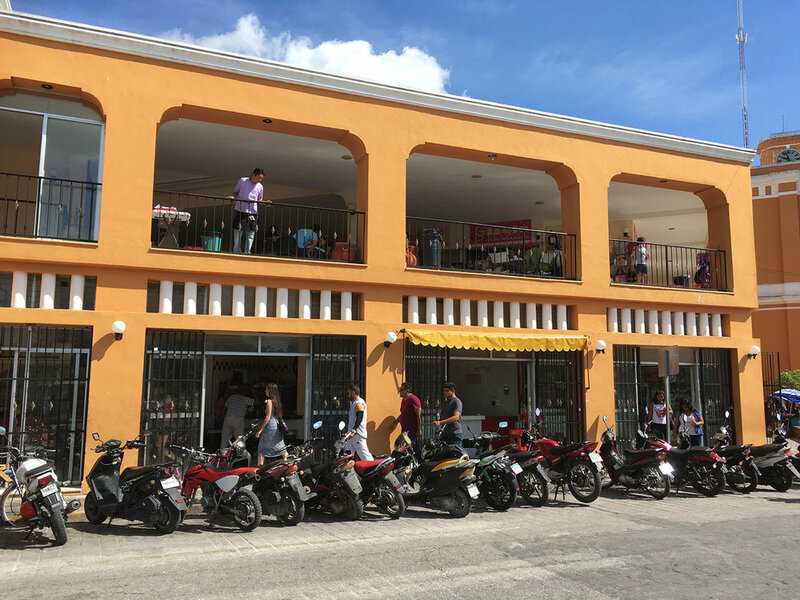 No tourists, local flavours, cheap prices, very different from Riviera Maya where everything caters to the tourists (including prices). The main square, zócalo, is built in a traditional colonial style. The Town Hall on one side, church on the other and the park in the middle. 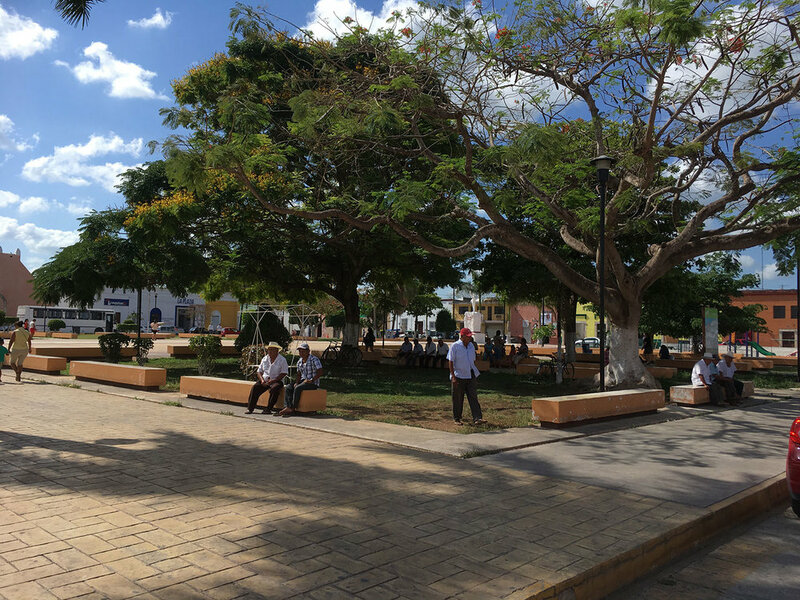 The park also provides benches, where you can sit in the shade of well-trimmed trees and stall restaurants with Yucatec specialties. Do try here (or at the market) huevos motuleños (Motul eggs) for your breakfast. The dish is made with eggs on tortillas, black beans and cheese. Marquesitas, crunchy crepes, are also very popular. It is a common street snack around zócalos in Yucatán. You can have them with savoury fillings or with chocolate (Nutella) and fruit. One you taste them, you will want them all the time during your stay in Mexico. 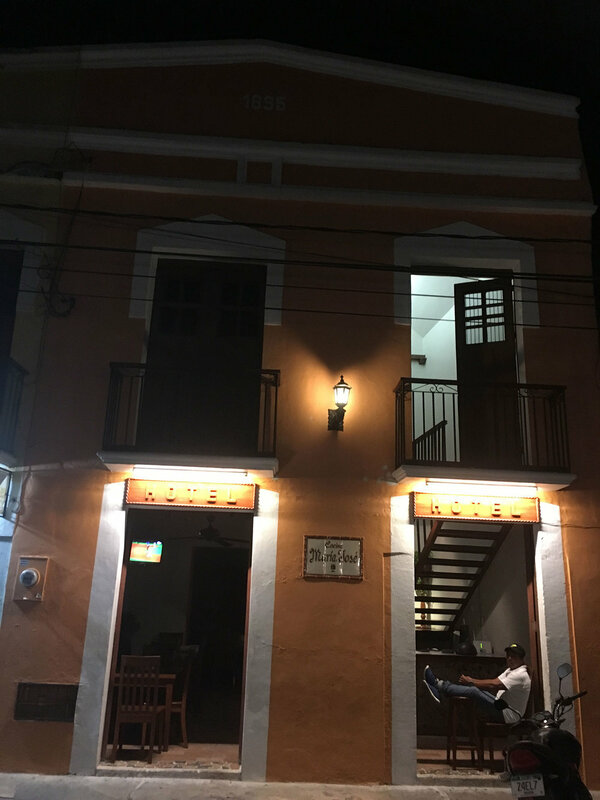 We stayed the night here, at the colonial hotel Casa María José (800 pesos for a double room in 2018). Nothing special but clean (with a/c, TV and a nice bathroom) and very handy, one block from the zócalo. The rooms are actually opposite the main house with the reception (as depicted in the photo on the left). Otherwise, it gets a little bit tricky. There are a couple of guest houses in town, but not so close to the main square. A more luxurious option would be the nearby Hacienda San José Cholul, south of town. Then you would be staying in the jungle, with the bonus of the iconic pool. A completely different experience (and the price)! To get to Motul from Mérida you have to take the Mérida-Tizimín highway; once on this road you will only have to travel 43km. The road is in very good condition and well marked. We came here from the Gulf of Mexico, and road 172 from Telchac; it is only half an hour's drive from there. From Mérida take road 176. There is a bus service from Mérida. Autobuses Centro operate a bus from Motul to Mérida hourly, and the journey takes 45 min. 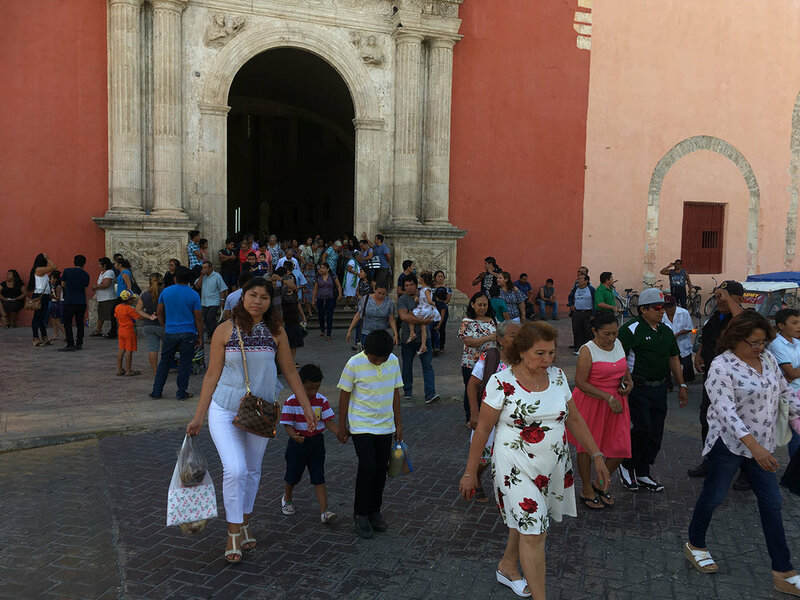 Autobuses Noreste Yucatán also services this route three times a day. The price is $150-190MXN. You can visit Cenote Sambulá and Hacienda San José Cholul.